Industrial Safety Barriers & Guard Rails protect people, walkways, machinery and buildings from collisions. The Industrial Safety Barriers & Metal Guard Rails provided by Omega Industrial Products are constructed from the toughest steel and provide non-penetrable support and protection. Removable guardrails protect workers, equipment, and structures from accidents caused by vehicles and machinery while allowing quick access when needed. Safety Metal Guard Rails prevent damage costs related to employee injury, company downtime, and machine damage. Removable guardrails are flexible enough to be used when needed, yet durable enough to provide the superior impact strength permanent highway guardrails clients have come to depend on. Guard Rails mounting posts ensure the performance of your highway guardrails system by providing the support needed to absorb impact while keeping your system securely attached to its foundation. Available in both inside corner and special angle designs, highway guardrails mounting posts are built to be both flexible and resistant to damage. Guardrail caps are not only a visually appealing way to finalize your Metal Guard rails system design, but they also help prevent further damage by absorbing and redistributing the force of impact during collisions. 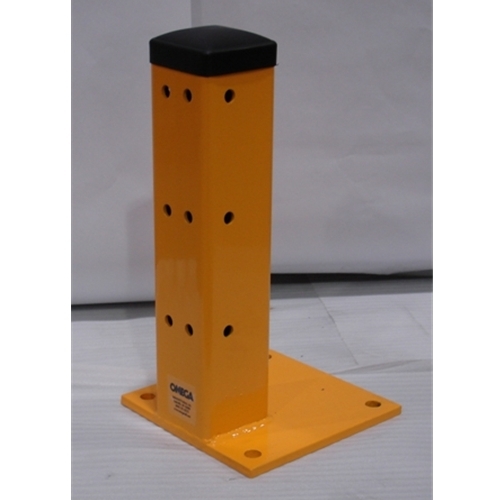 Omega guardrails brackets allow the mounting of metal guard rails systems in a variety of ways. Angle brackets extend the angle and location of your highway guardrails system, while inside and corner brackets create clean transitions in places such as curves, building walls, and on-ramps without the use of additional posts. All of our products can be easily customized to your specific needs and dimensions. Whether they are in height, length, color, location, or functionality. Request a quote and we will contact you. For your convenience, Omega has gathered Architectural Specifications for a wide range of products. Download them here. All of our products can be easily customized to your specific needs and dimensions, whether they’re height, length, color, location, or functionality. Contact us today. Everywhere around the world we are dependent on industrial workers to manufacture and handle equipment under hazardous conditions they often work under a huge risk of losing a life. So it is the duty of every industry to ensure their workers with the best safety equipment. It is legally and mandatory function that every company needs to fulfill. There are multiple industrial safety products that are produced world wild. Some of the products are Metal Guard Rails, highway guardrails, bed guard rails, warehouse and crib guardrails, Handrails and stairways, protective guard rails and floor angles and much more. It is a natural setting for many manufacturing and processing industries involves a variety of critical safety points. This is due to the production system which utilizes heavy, chemical and other sensitive material and processes. Typical industrial hazard can include chemical exposure to the body, ergonomic hazards due to frequent and or intense physical strain, as well as other physical dangers such as heat or heaving moving parts. The issue of industrial safety has evolved concurrently with industrial development in the United States. A key development within industrial safety is the Occupational Safety and Health Administration (OSHA). Through the support of other organizations like the Environmental Protection Agency (EPA) and the National Institute of Occupational Safety and Health (NIOSH), these organizations are able to develop mandatory safety and health standards for all sensitive work environments. For the systematic protecting the wearer’s body from different types of injuries, while working in a hazardous environment, it is recommended to make use of safety products and industrial safety products. Omegaindl Provide a large range of industrial safety products which includes a wide range of highway guardrails, handrails, stairways, overhead door and protective metal guard rails, floor angles, and custom safety barriers. A handrail is less preventive than highway guardrails and presents both support and the defensive restriction of margin. Most public properties have guardrails as a means of safety against unintentional falls. Industrial guardrails protect machinery and provide a safe and efficient work environment, it’s most important role is protecting people. The Industrial Safety Barriers & Guard Rails provided by Omega Industrial Products are constructed from the toughest steel and provide non-penetrable support and protection. Guardrails sheet is economical and easy to use temporary fall protection metal guard rails system for multi-story buildings. Omegaindl Guard Rails are easy to install. This provides considerable savings in time and installation costs. In elevated situations where there is a danger of kicking something onto someone below, OSHA requires the use of 2 × 4 sized toe board between the bases. The bases of the highway Guardrails can be retrofitted with our custom Speed boards. Zinc plated finish looks professional and will last for years. The highway Guardrails are portable and can be dismantled/assembled as the need arises. Our Metal Guard rails meet or exceed OSHA requirements for OSHA Regulations 29 CFR 1926.500 – 503 and 29 CFR 1910.23. Our guardrails are used by the construction industry, warehouses, manufacturing, and commercial facilities and in public safety situations. There is a whole range of guard railing which includes porch and deck railing, rail guards, gate rails, metal guard rails, and highway guardrails. virtually, they have free maintenance as they look fresh every year. Guard railing is easy to install and includes all the necessary components with step by step guide. Rail guards also have a warranty against protection of program. Guard railing systems can be used in different applications from indoor to outdoor functions. Omegaindl Guard railing proudly introduces rail guards that are highly durable and reliable. The unique design of rail guards adds style to your outdoor space as well as indoor areas. While there are OSHA guidelines regulating the use of handrails and other guarding devices in facilities for structures such as stairs, mezzanines, temporary manhole covers etc. ; there is no direct guidance for the use of highway guardrails around machinery or designated vehicle travel paths. OHSA Industry Regulations state that a guardrail should typically range between 42 and 44 inches in height (though shorter and taller highway guard rails are sometimes allowed). While mid-rails aren’t necessarily a requirement, they are strongly recommended for secured storage shelving and other locations where a loose object could go under the top rail, fall, and land on someone below. 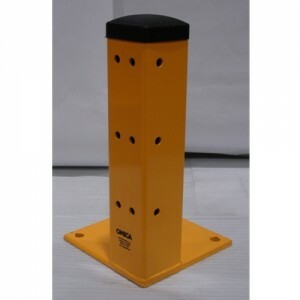 The guardrails play a vital role in industrial safety and the proper assembling of the guardrails face can save lives.